AMD’s upcoming Radeon HD 8970M “Neptune” mobile graphics card has been listed on EBay along with its specifications. Previously, it was expected that atleast the upcoming mobile series unlike the OEM based HD rebrands would be based on an updated architecture however the details mentioned suggest that the GPU is nothing except a faster rebrand of the HD 7970M. 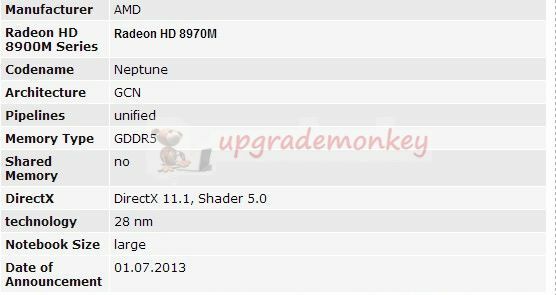 AMD Radeon HD 8970M “Neptune” – Rebrand of HD 7970M With Faster Clocks? 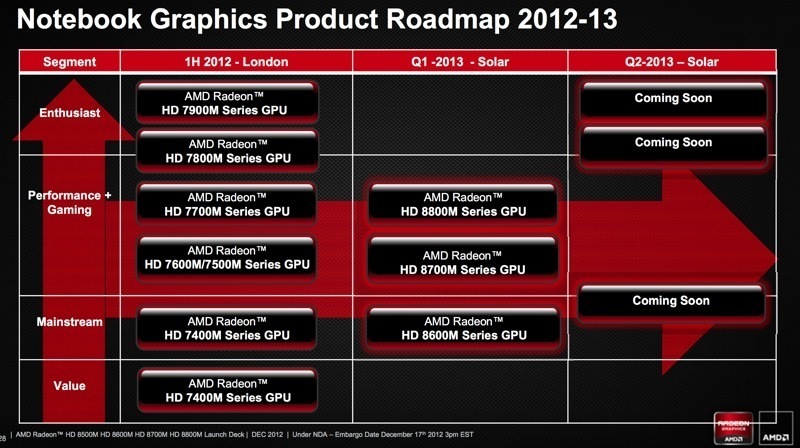 The AMD Radeon HD 8970M “Neptune” is part of AMD’s HD 8000M Solar series lineup for notebooks. The HD 8970M is the successor to the 7970M however specifications wise it isn’t much different at all. The Radeon HD 8970M is still based on the same Pitcairn architecture used on the 7970M featuring 1280 (1D) stream processors, 80 texture mapping units and a 256-bit GDDR5 memory interface. Last month, performance slides revealed by MSI showcased a 7.5% increase of the HD 8970M over the GTX 680M from NVIDIA. The slide also showcased other upcoming mobile GPUs performance which include Saturn XT/Pro and Venus XTX. The chip on Ebay is on sale for $850 which is $200 more expensive than the HD 7970M. The Radeon HD 8970M “Neptune” would most likely feature faster clock speeds over 7970M’s 850 MHz core and 1200 MHz memory clock which would give it the boost. The possibility of AMD including their new Boost tech is also very likely. However with this kind of performance, AMD would just marginally beat the faster GTX 680MX GPU which is infact NVIDIA’s fastest mobile chip currently and is about to be replaced by the much faster GTX 770 and GTX 780M graphic cards which are expected to be released soon since notebook manufacture’s have already hinted at them in their upcoming gaming products. Monster and Deviltech are two of these makers who will be shipping these upcoming chips in their new products and can be seen here. AMD might definitely be needing much more firepower to tackle NVIDIA’s upcoming chips since it was suggested on the notebook makers page that the GTX 780M on the DevilTech’s DTX Fragbook packs 8 GB GDDR5 memory and the chip is 30% faster than its predecessors scoring 29,458 points in 3D Mark Vantage. So we might not be looking at any new GCN 2.0 product in Q2 either except the recently launched HD 7790 which has a Bonaire chip and more possibly AMD’s upcoming Radeon HD 7990 which may or may not be using a next generation chip as suggested by its much lower power consumption inputs compared to those from its AIB partners.